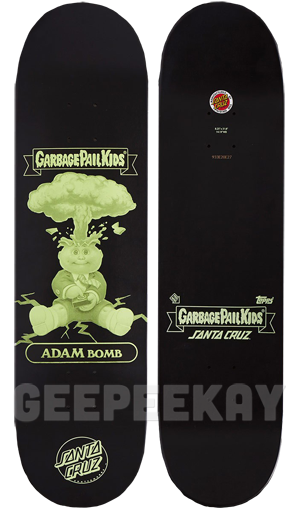 In May, 2017 SANTA CRUZ blew the minds of collectors around the world by announcing an exclusive line of Garbage Pail Kids skateboards! 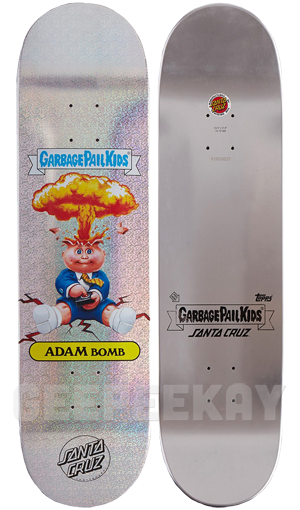 Santa Cruz is a skateboard company that (similar to Topps with GPK) experienced a very iconic period in the 1980s. 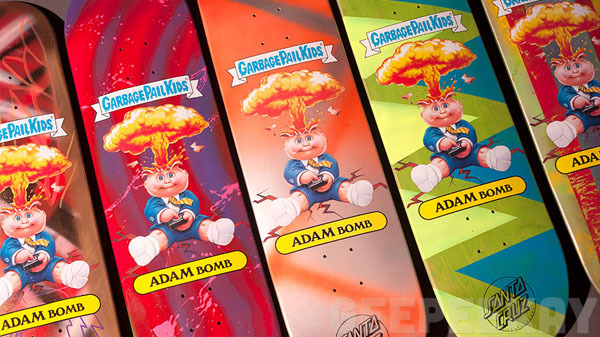 Breakthrough art and clever concepts made them one of the most popular skateboard companies in the world. 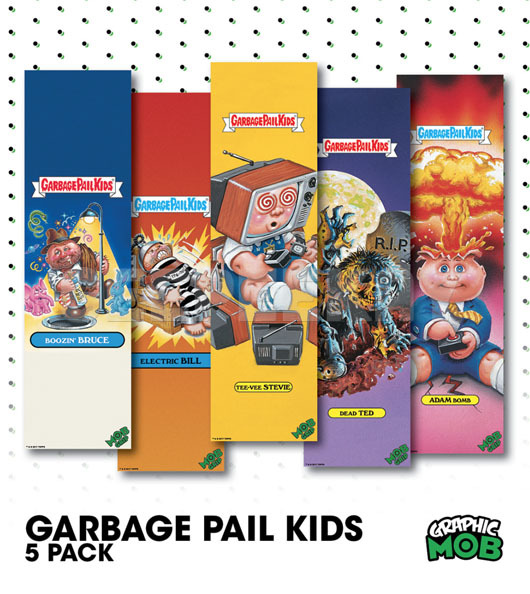 So when they sat down to try and come up with something new and fresh to do in 2017, the combination with Garbage Pail Kids just made sense. That experience of ripping open a pack of cards...the feeling of not knowing what was inside...is something Santa Cruz wanted to bring to the skateboard audience. 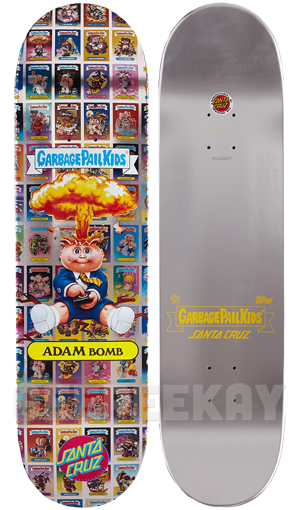 So they teamed up with Topps and released the first ever blind bag skateboards! 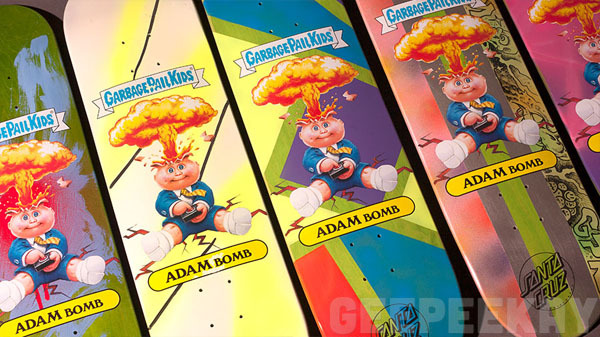 This page contains pictures and information on what is quite possibly the most radical collaboration ever to hit the GPK-scene! 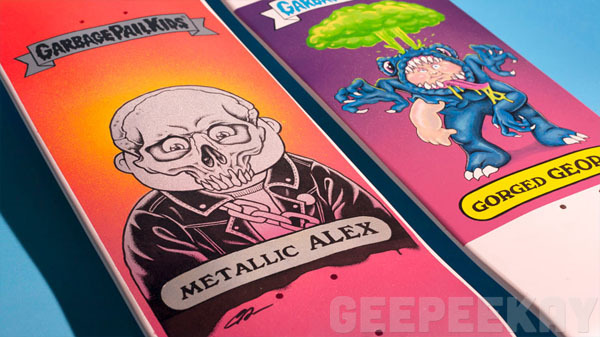 Teaser images first surfaced back in May, 2017...and featured images of all nine variations of skateboards available for collectors to buy. At the time it was a bit confusing how skateboards could be a 'blind bag' product...but over time Santa Cruz released further details and videos showcasing their upcoming release. Coincidentally (or well-planned), Topps and Santa Cruz had a huge presence at the New York Comic Con in October, 2017. 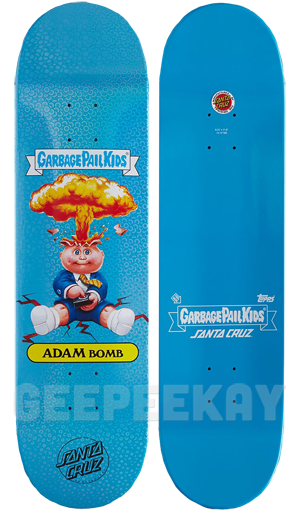 This convention took place the weekend prior to the October 9 release date...but Santa Cruz decided to get the party started early and SOLD OUT of every deck they took to the show. 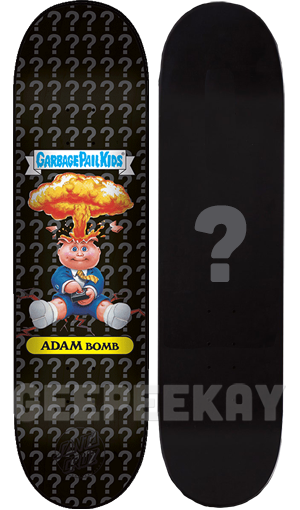 Each skateboard deck is packaged in a "blind bag" to keep it a secret exactly what variation is inside. 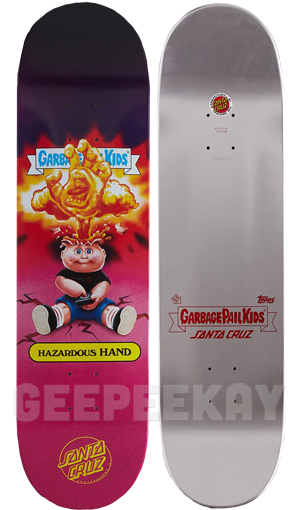 Santa Cruz stated this was a direct shout-out to the packs of Garbage Pail Kids from the 80s...and they wanted collectors to rip open a deck with the same anticipation as ripping open a pack of cards when they were a kid. 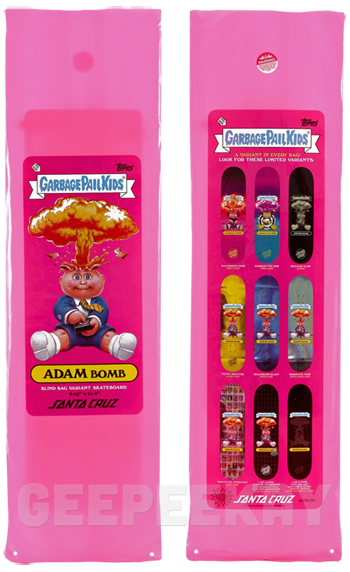 The packaging is a bright 'Original Series 1' pink, and includes an Adam Bomb graphic on the front, and a visual checklist on the back. 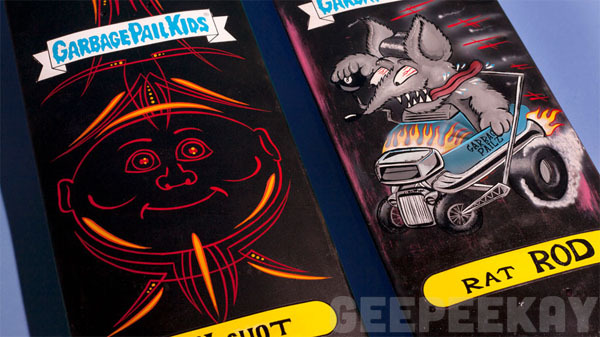 Each blind bag contains one deck and three collectible stickers. The decks themselves come wrapped in white tissue paper which not only helps protect the image, but also serves as an extra little delay in seeing just which board is in the bag. 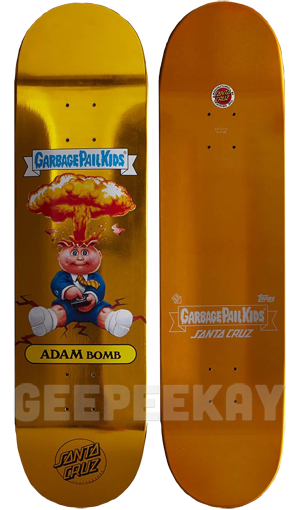 The stickers included with the board include a Santa Cruz logo sticker, and two stickers created specifically for this project (featuring artwork from PitchGrim). 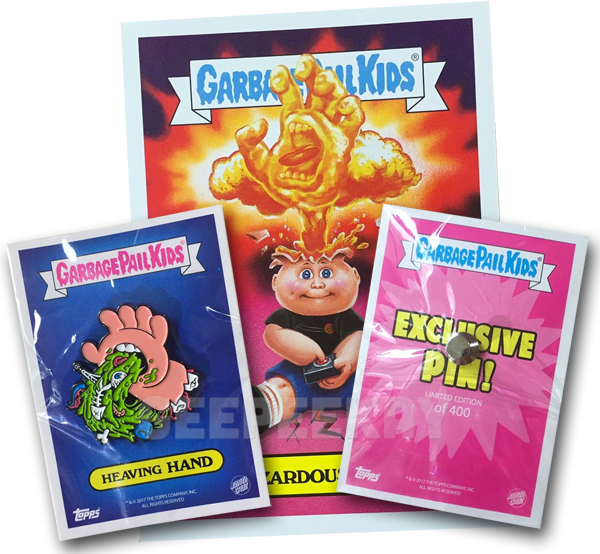 They include a Garbage Pail Kids card featuring Hazardous Hand, and a GPK-style screaming-hand (barfing hand) that is popular in Santa Cruz graphics. 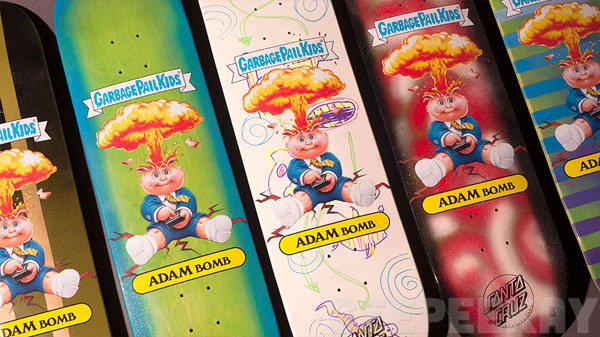 These stickers are affixed to the board with a little glue (and sadly leave a mark on the back of the Garbage Pail Kids sticker). 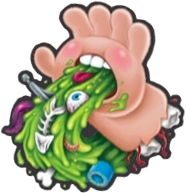 Below is an image of how the top of the deck looks when being removed from the blind bag. 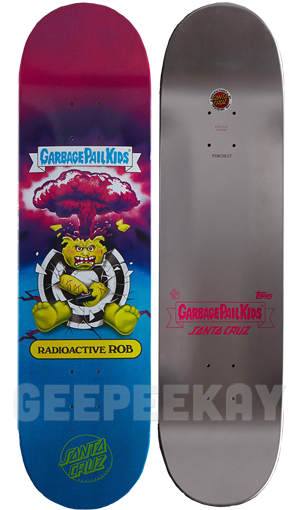 Below are images of the different skateboard variations available in the blind bags. 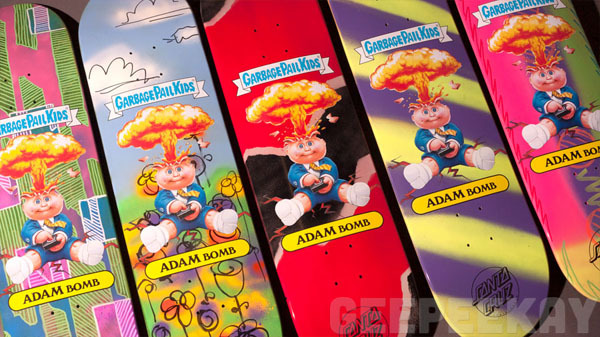 There are a total of NINE different boards to collect, with the hardest being the 1:1 Custom Colorway and Custom Artist boards. 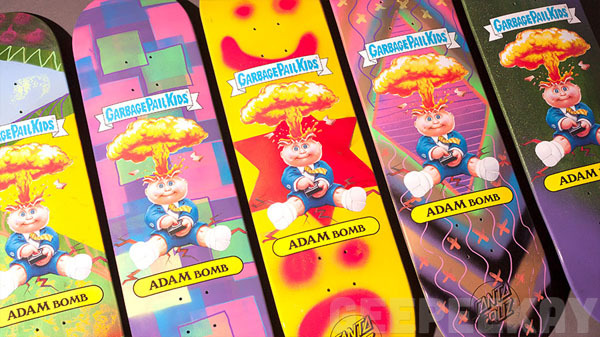 Santa Cruz reached out to fifteen different artists to work on a total of 24 CUSTOM ARTIST boards for the Garbage Pail Kids collaboration. Of those 24 boards, ONE was given away at the New York Comic Con in October, 2017...leaving only 23 BOARDS available for collectors to find in blind bags. 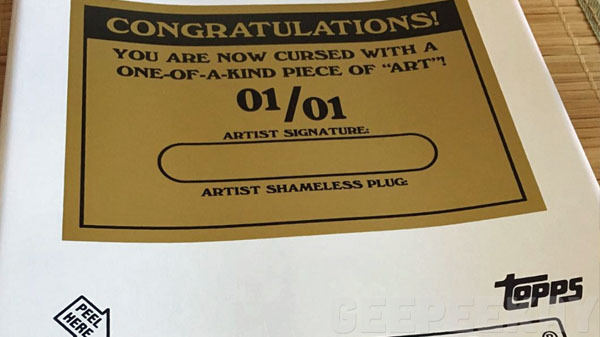 Below is a gallery of the different custom boards the artists created for this project. 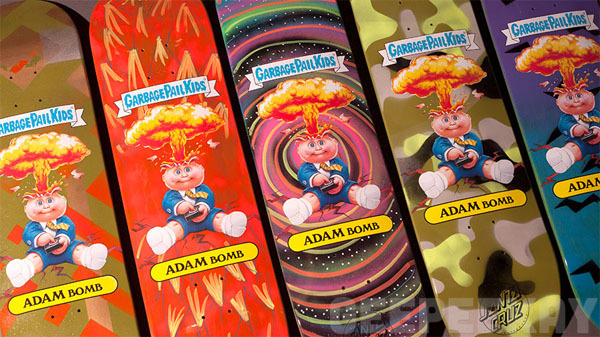 In somewhat of a surprise release, Santa Cruz and MOB Grip released a series of Garbage Pail Kids-themed skateboard grip tape. 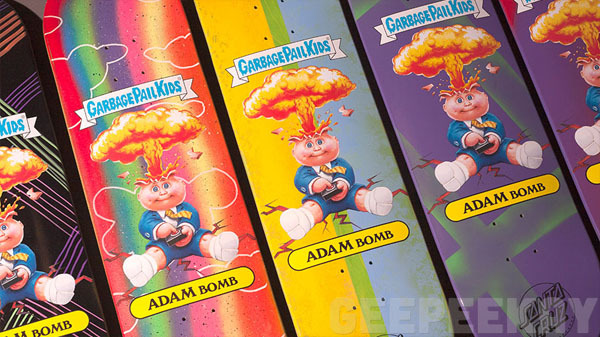 Each sheet measured 9" x 33", and featured one of five different Garbage Pail Kids characters on the tape (below). 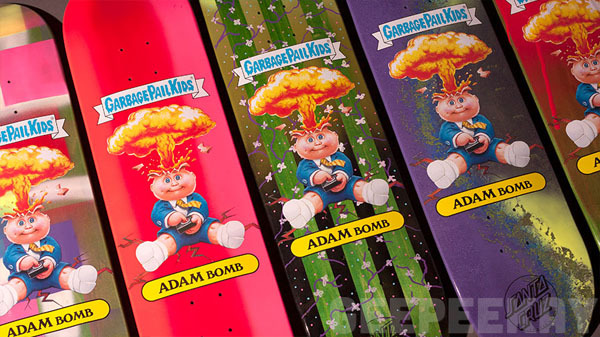 These sheets of grip tape were released AFTER the craziness of the blind bag decks began to die down, and surprisingly enough there were no leaks or teases prior to the official release. These were sold individually and in 5-packs...and both options sold out incredibly fast. “We have some really cool plans coming for summer 2018…"